Greek sophomores sat in a half-filled Thompson Recital Hall Tuesday night, eager to voice their questions and concerns to President Mark McCoy and other members of the DePauw administration. The Vice President for Student Academic Life Alan Hill, Dean of Students Myrna Hernandez and Director of Campus Living and Community Development (CLCD) Jean Carlos (J.C.) Lopez stood alongside President McCoy to listen to and address the students. The session began with students expressing their concerns about subjects varying from partying to Public Safety. “We have been attempting to build a high trust environment between the administration and Greek Life. We’re here to listen first, and we’ll answer questions later,” President McCoy said. President McCoy also said that changes have already been implemented as a result of the previous meetings. Students then immediately questioned what changes had been made. McCoy cited the new Safe Ride Van as a change, as well as ongoing discussions he said he has had with Public Safety to help ensure student safety and to relay student concerns. The administrative members tried to focus the meetings on keeping people on campus safe. “I’ve had people saying it’s not alcoholism until you graduate, but it is,” McCoy said. He went on to say that students at DePauw have a higher average blood alcohol content (BAC) than students at larger schools do when hospitalized. Additionally, Hill went on to say the highest BAC on recent record at DePauw, .50, was from a student’s guest who did not attend a fraternity party. “Alcohol is not just an issue with the Greeks,” Hill said. President McCoy said he is part of an organization of university presidents who are working to lower the drinking age on college campuses. “I think college is about partying,” McCoy said. The administrative representatives and students discussed how communication between CLCD and Greek chapters needs to be faster than it is currently. Despite agreeing on this topic, Hill said the punishments given to Greek chapters are appropriate. “All of the fraternities know why they didn’t have certain events,” Hill said. “I’d rather drag it out and have all the facts than just wrap it up quickly. You don’t want us to just do it quickly and hand it back to you.” He added that often times fraternities are put on probation during investigations for the safety of potential guests. 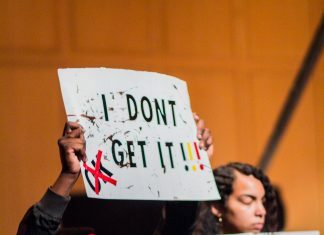 Students voiced worries about Public Safety’s involvement with students, but the administrators stated that there had been no recent increase in Public Safety activity. “We’ve had four people cited this semester and in all of those cases there’s been some other mitigated circumstances” Hernandez said. Those circumstances, she said, often include instances when the cited student fights with an officer or is so visibly drunk that they cannot stand up on their own. She also said there were eight citations during Winter Term. Additionally, those present discussed the situation on March 1 when a drunk Greencastle resident caused a disturbance on campus. Students generally agreed that they wished Public Safety had notified them earlier. The administrative members at the discussion said their ultimate goal is to have a self-governing Greek system, but they believe that requires more trust on both sides, which has yet to be earned. McCoy said a lot can be solved if Greek organizations that get in trouble for rule violations simply tell the truth about the event in question at their community standards meetings. He cited two fraternities that had done just that recently, adding that the issue was resolved quickly because all parties were honest. Overall, students had mixed reactions to the meeting. Some said it was positive, while others did not. Many students hope to have an open line of communication with the administration. Students hope that the administration will follow through with the changes students desire. Some students were not so optimistic about the idea of greek chapters being completely self-governing.